If you have any friends that could benefit from joining TopCashBack then you can get $20.16 by referring them. Follow my referral link to find out how. If you aren't a member then check out their site. Its pretty competitive with other cashback shopping portals like Ebates. I've been tracking comp data for our rentals via Rentometer.com roughly quarterly when I remember. I'm however now about to give up on Rentometer. The last time I checked was August and the data I looked up today is completely unchanged for 3 of our 5 properties. Properties A, C & E are exactly the same in all points compared to August and that can't be valid. I know for a fact that rents for the areas that A & E are in are going up pretty fast. I'll probably switch to using Zillow.com and/or Craigslist..com Zillow just gives their Rent Zestimate which is just a single dollar estimate of rental value. But it doesn't seem to handle the mult-plex properties too well since it doesn't seem to cite rents for individual apartments. It works well enough for the single family homes though. Plus I can get a lot better filtering on Craigslist so it will be better. It takes a lot longer to do such comp checks on Craigslist however which is why I've liked to use the simple / easy test on Rentometer. 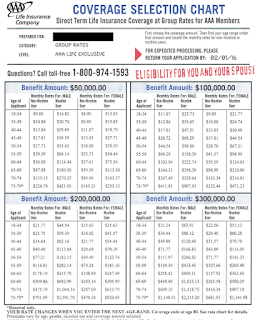 I received an offer in the mail to buy AAA group life insurance. The rates are pictured to the right. That image is probably too small to read as shown but I'll cite some example prices. 18-34 year old male (non-nicotine user) for $31.24 per month. 74 year old female gave no options available. Pretty much across the board, the AAA group rates are higher for the age groups I looked at. Of course the quotes on Term4Sale are based on good health so your exact rate may differ depending on the details. The AAA insurance offering does say they don't require an exam and they only as a few basic health questions. AAA does also have options for people in their 70's which I didn't find on Term4Sale. It pays to shop around for this kind of thing. ShopYourWay Everwhere site features several merchants that can get you $15 back in the points during the month of January after you spend $15 or more.. Partners include : Groupon, Fandango, Dollar Tree, Diapers.com, Old Navy, Office Depot, Staples, Carters, GameStop, REI, Petco, Petsmart and others. If you had any thing to buy at these merchants then using the SYW portal will get you some free extra points. This week they also have $10 back on Chaps, Rakuten, Vans & Liz Claiborne brands with ShopYourWay when you spend $10. Thats in the weekly new brands deal. Offer good for 1/10 to 1/16 only. For the $10 and $15 deals the terms say that : Purchase requirement before taxes and after gift card payments and other discounts and must be made in a single transaction. and Points may take up to 45 days to be awarded to member account. Sears has a number of items which will get you 100% points back. They have several phone charging accessories like cables, 12V to USB car chargers and a few batteries. See the SYW Weekly Member Deals for all the discounts. This is kind of like a free after rebate deal but you get the purchase price refunded in points. The points do however have a relatively short expiration date. Generally they have free ship to store but ship to home availability may vary. The 100% back items bought at Sears can also be stacked with other cashback portals. Discover Deals gives 5% back at Sears for example. If you're interested any of these SYW deals then make sure you've got a good use for points at Sears or Kmart. Buying phone cables to get free points and then not having anything good to use for those points isn't going to save you money in the end. Also be aware of the expiration periods for the points deals. UPDATE 4/28/16 : eBay is no longer allowing you to buy their gift cards using gift cards. Today eBay has a deal to get a $100 gift card for $95. That doesn't seem to spectacular as its only 5% off. But... you can use gift cards to buy this. AND... you can do it again next time they have a deal... and again... and again.. By doing this you can make $5 in eBay gift card balance every time they have such a sale. So far as I've done it 4 times on Dec. 23rd, 27th, 29th and now January 8th. My original $95 is now worth $115. As long as they keep doing it there is no reason I can't keep getting $5 free every time. I found the deals posted on Fatwallet. Todays deal is posted there. If you watch Fatwallet you'll see the $100 for $95 deals posted. It only then takes a minute or two to go buy a card. Of course you do have to start with $95 and you've got to have a reason to want credit at eBay. They do have a variety of gift cards from other merchants (Target, Home Depot, Sears, etc) to buy so that could be a good use for you if you don't want to buy merchandise at eBay.